An aerial shot of high-flow water release from Glen Canyon Dam in 1983. Since the completion of the Glen Canyon dam in 1963, Grand Canyon has been a “tamed” river — for the most part. In 1983, twenty years after the dam opened, a combination of management decisions and high spring runoff resulted in Lake Powell filling to the brim. Dam releases, ordinarily on the magnitude of 10,000 cubic feet per second (cfs), increased to nearly 100,000 cfs. That summer, boaters still ran Grand Canyon. Jeffe Aronson, an experienced Colorado River guide, has put together a couple videos showing what the Colorado River looked like during high-water conditions in 1983. They are nothing short of phenomenal. There’s more great stuff on his website and vimeo channel, and he also has a multi-part book you can get on an Amazon Kindle. Credit: 100,000 cfs Colorado River Grand Canyon 1983 Part 1 of 2 from Jeffe Aronson on Vimeo. 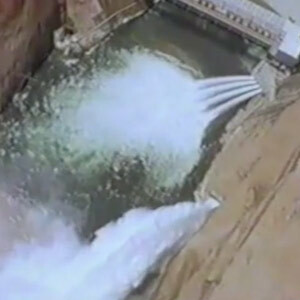 Credit: 100,000 cfs Colorado River Grand Canyon 1983 Part 2 of 2 from Jeffe Aronson on Vimeo. Very cool vid. Scariest rapid in the canyon by far. I paddled a surfboard on the left side of the hole on a trip with Bill Skinner in 1984 i think. I made it but that was probably the dumbest thing I’ve ever done.